I've decided that this year I must be more organised and get some drawings done in readiness for all the competition/exhibition deadlines which loom early in the year. As we travel quite a lot, particularly in the Winter months, I'm fed up with having nothing suitable to submit (or having a last minute panic to get some work done) when the calls for entry are sent out. I have photographed so many Indian characters over the last few years that it took ages to decide which one to tackle next. I settled on this one as I liked his wrinkles, whiskers and the colourful turban and warm blanket/shawl he's wearing ... lets see if I still like him after working on those textures! I got off to a bad start. I found a pad of heavyweight watercolour paper which had no cover. I guessed it might be some Fabriano Artistico which has been laying around for many years and which is now discontinued. But having spent several hours carefully indenting the paper to keep all those whiskers white, I realised I'd wrecked the paper surface. No matter how carefully I applied colour on the indented sections to highlight the indents the surface kept flaking off and just looked unsightly. So first attempt went in the bin. My last experience using coloured pencils on Pastelmat wasn't a good one. The colours seemed to disappear into the cork surface after a couple of hours and the work became dull and lost its vibrancy. Another artist reported the same problem and I think we came to the conclusion we may have had a rogue batch. I decided to re-start this drawing using Pastelmat but selecting a different colour/batch and so far, so good, although I haven't got many layers down yet. 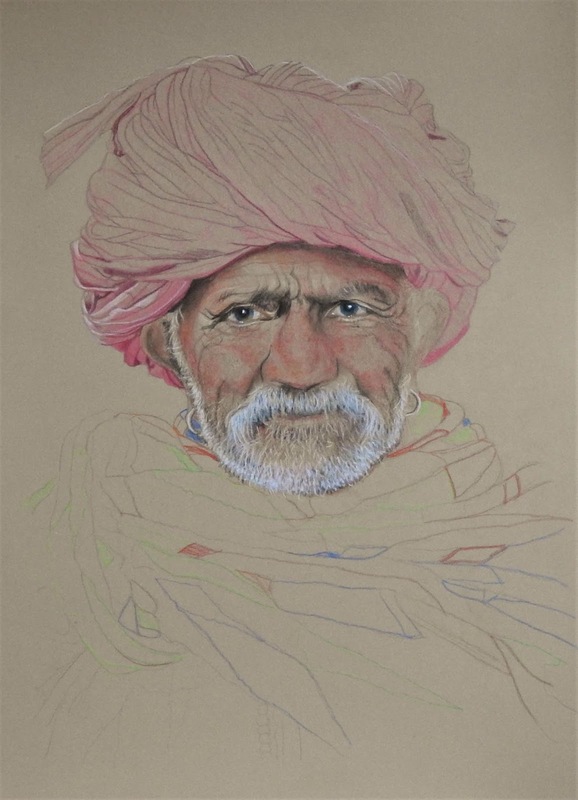 Polychromos pencils on Pastelmat - approx 12" x 16"
Sue, I really, really like this guy. 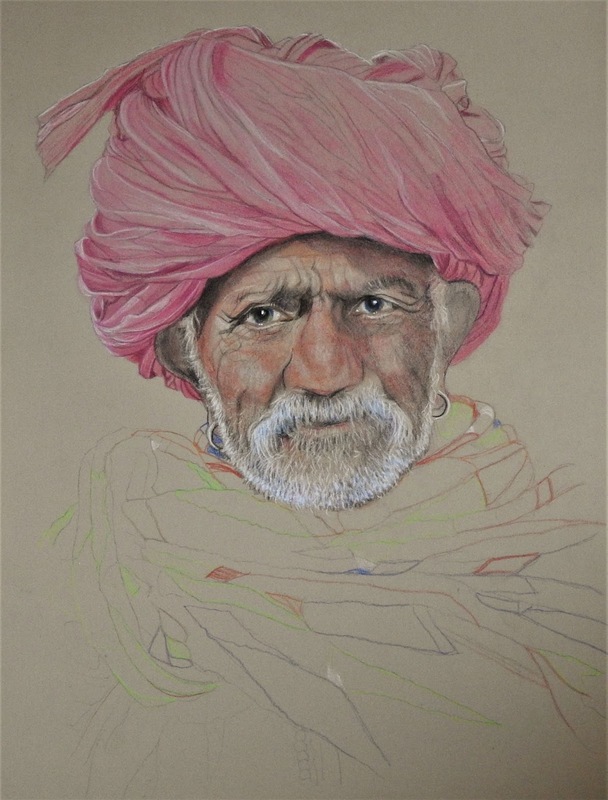 His expression is wonderful and the colors in his turban and clothing will make him exquisite! looking really good :) the fabric is really well done!